One of my very first "printed" images. This uses much the same parameters as the previous image except the inside is squares and the outside is biomorphs. The formula and plane are the same. 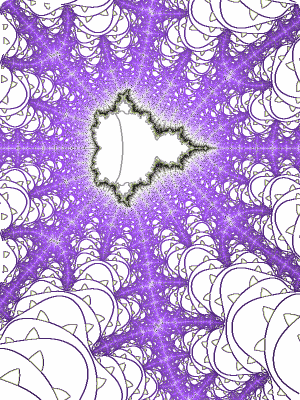 I really like the mandelbrot's dark outline and the grey, pencil-like, inner shading with the single line like a belt across the "stomach."